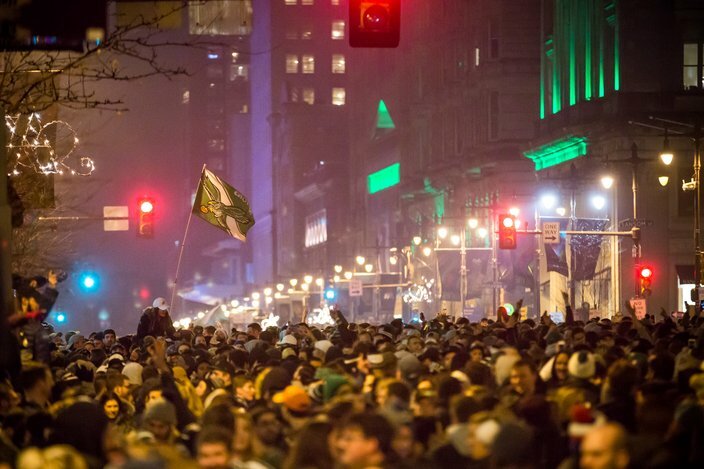 The city erupted in joy Sunday night to celebrate the Eagles' thrilling 41-33 victory over the New England Patriots in Super Bowl LII. 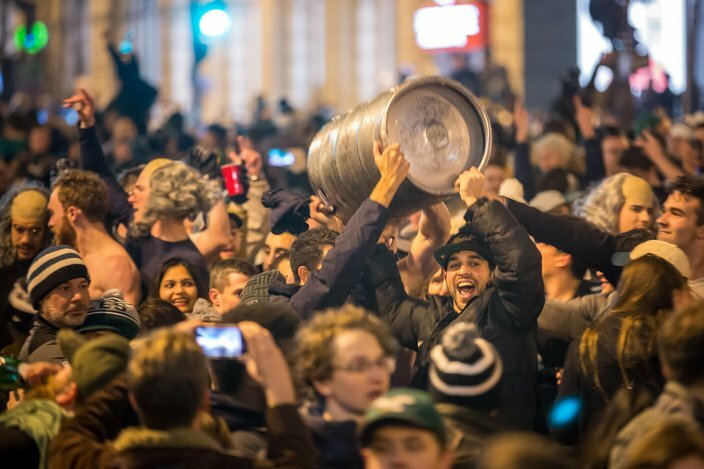 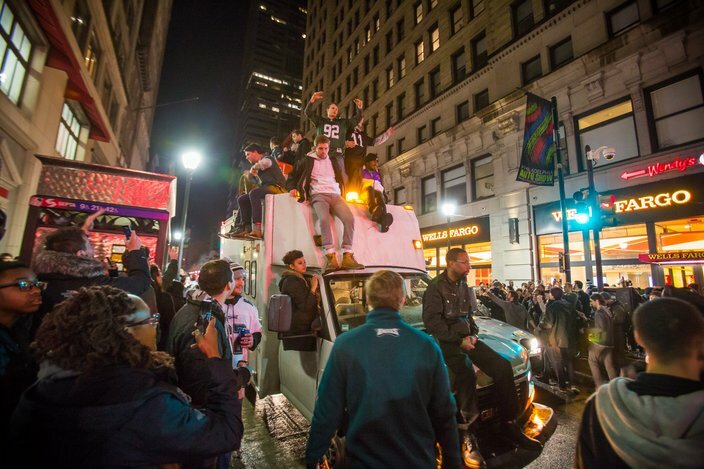 Thousands of fans poured out of their homes and bars onto South Broad Street to mark the first Super Bowl title in Philadelphia history. 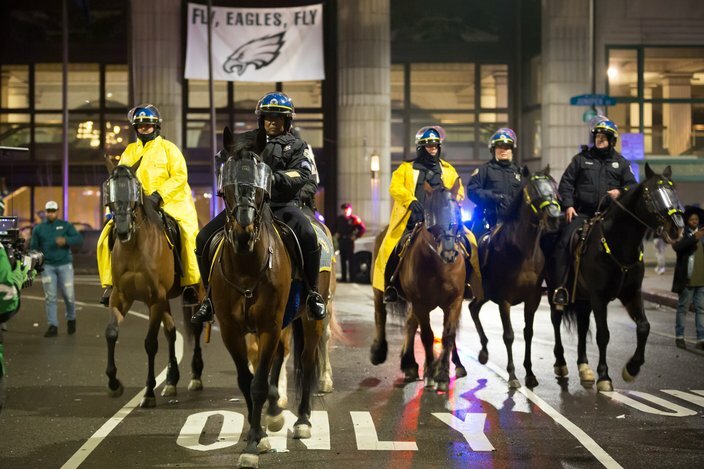 A huge police presence was in place. 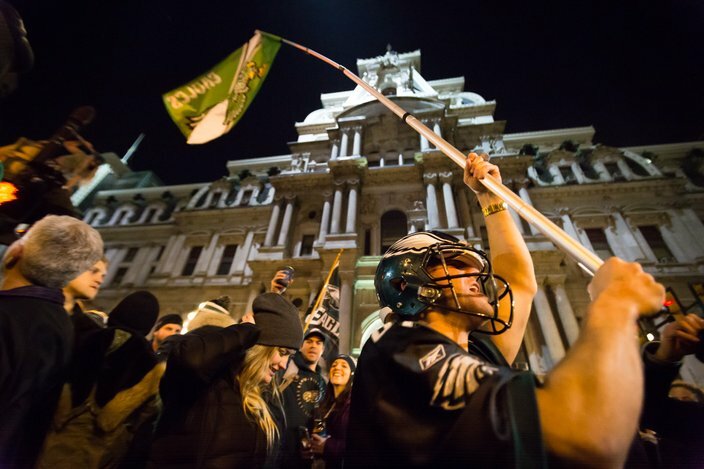 Tommy Lang, 23, of West Philadelphia celebrates the Eagles win in Super Bowl LII on Sunday night, waving a flag on South Broad Street in Philadelphia. 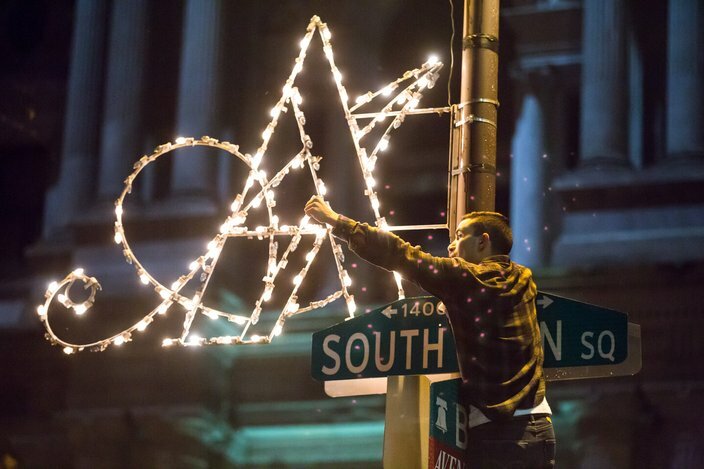 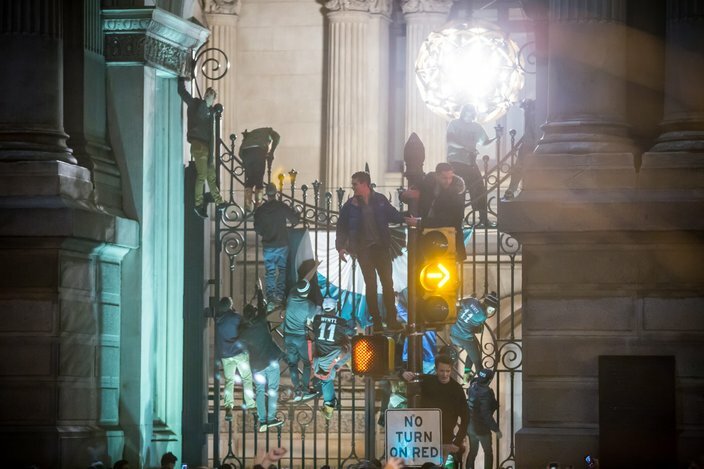 Fans climb the south gate of Philadelphia City Hall after the Eagles win in Super Bowl LII on Sunday night. 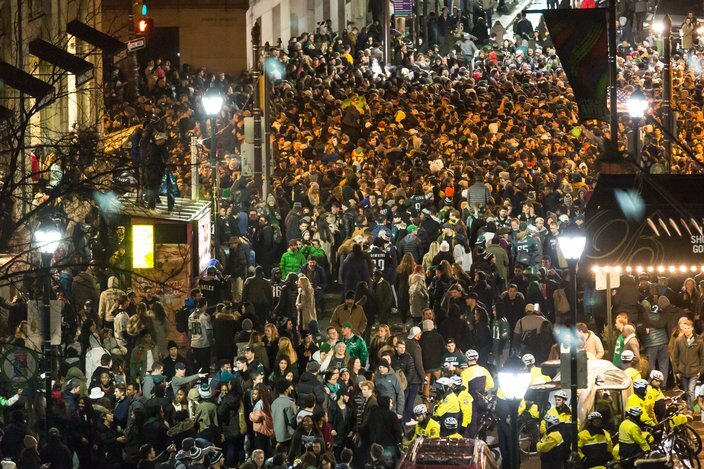 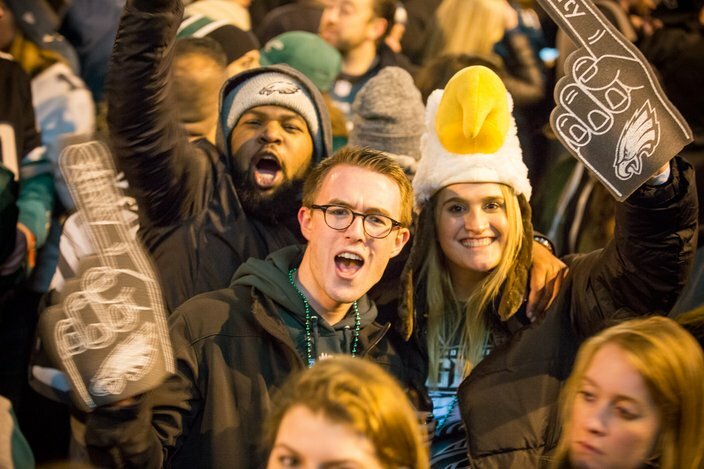 Fans celebrate the Eagles win in Super Bowl LII on Sunday night, gathering en masse on Chestnut Street in Philadelphia. 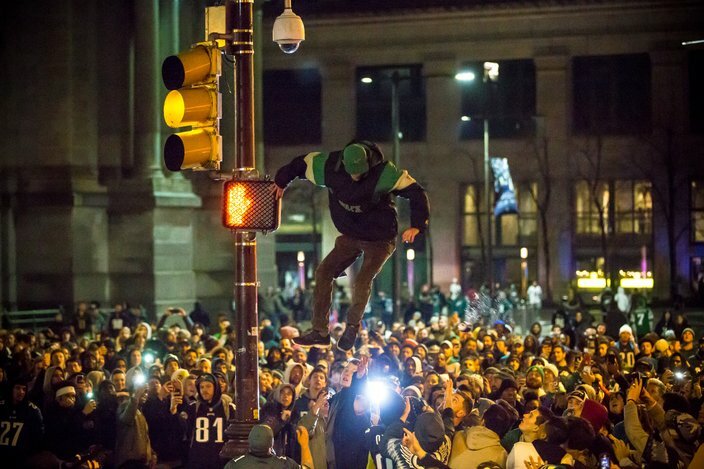 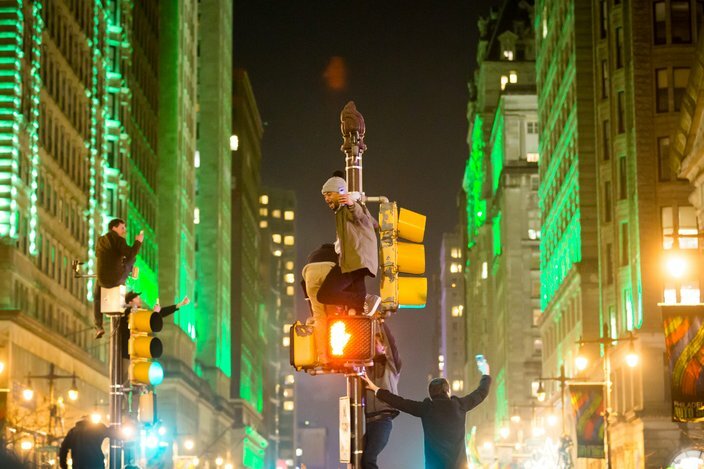 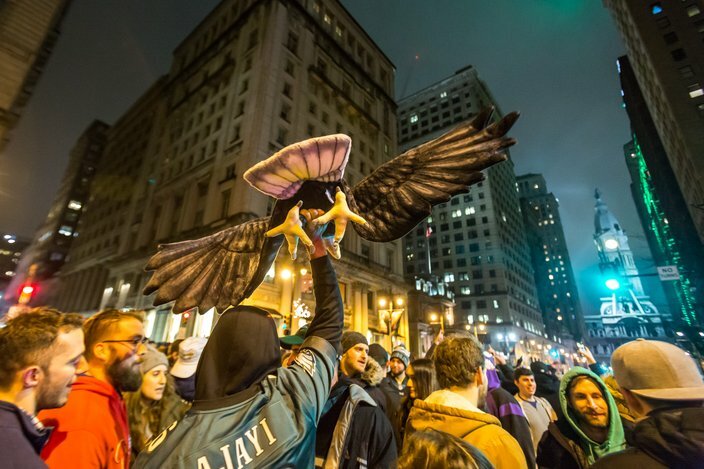 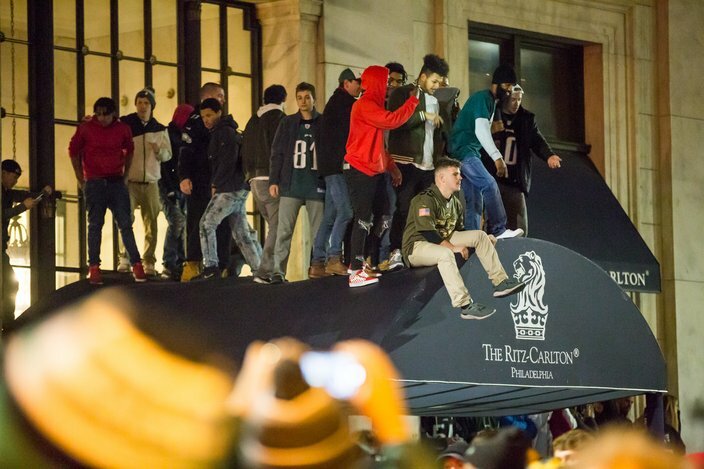 About a dozen fans celebrated the Eagles victory in Super Bowl LII on Sunday night by climbing onto a canopy at the Ritz Carlton hotel on South Broad Street in Center City. 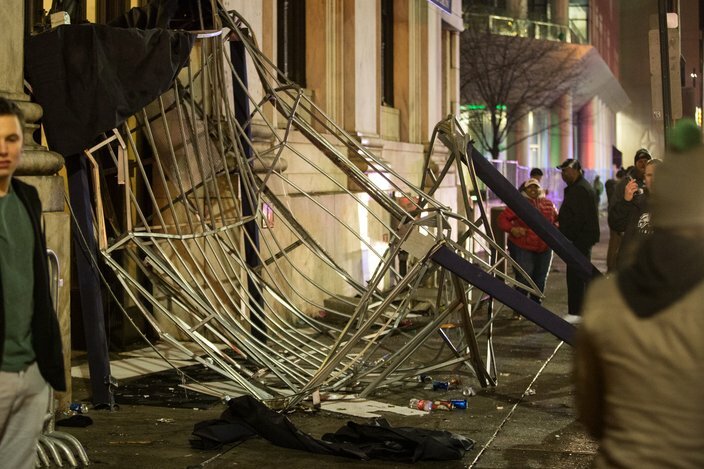 This photo was taken as the canopy collapsed under their weight dashing them to the sidewalk. 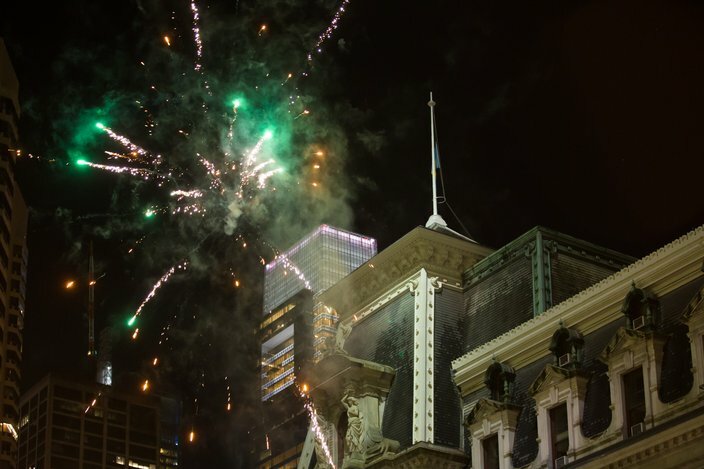 Fireworks erupt near Philadelphia City Hall during celebrations after the Eagles win in Super Bowl LII on Sunday night. 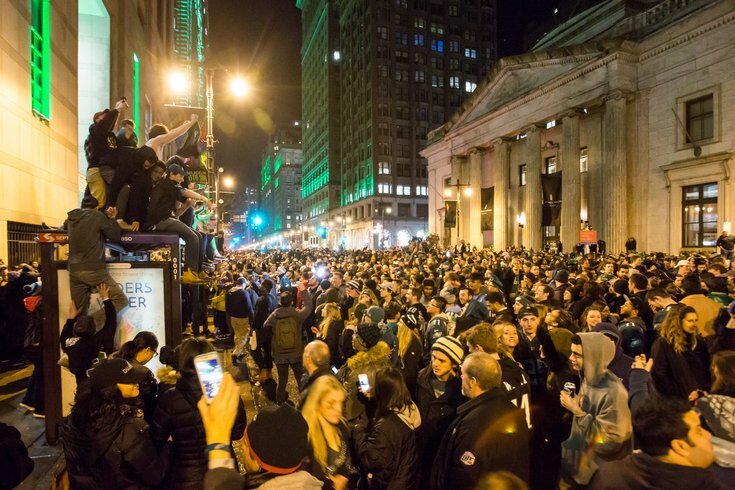 Fans celebrate the Eagles win in Super Bowl LII on Sunday night, gathering en masse on Walnut and South Broad Street in Philadelphia. 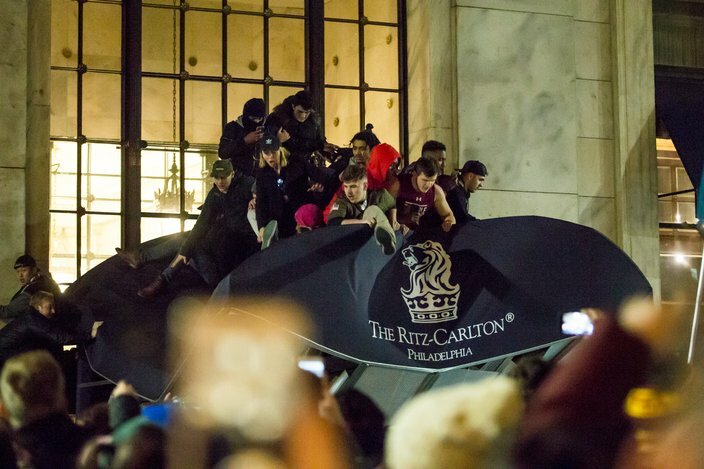 The aftermath of an canopy that collapsed at the Ritz Carlton on south Broad Street after about a dozen fans climbed onto it, causing it to fall to the ground from their weight. 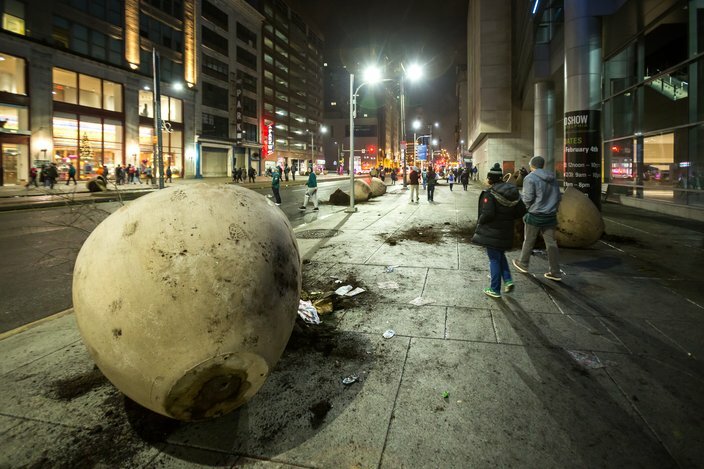 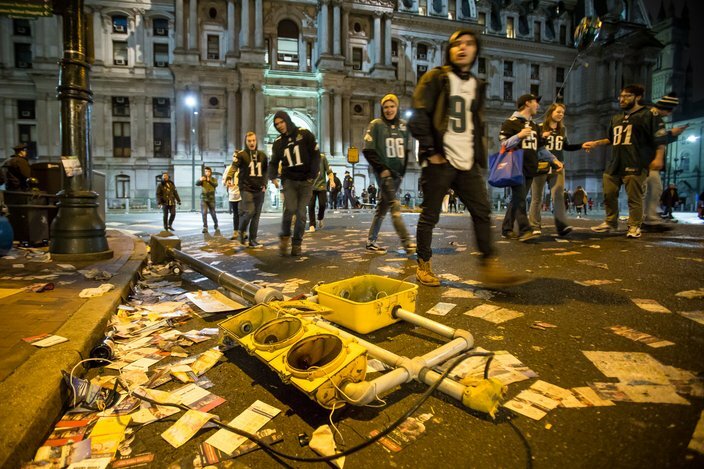 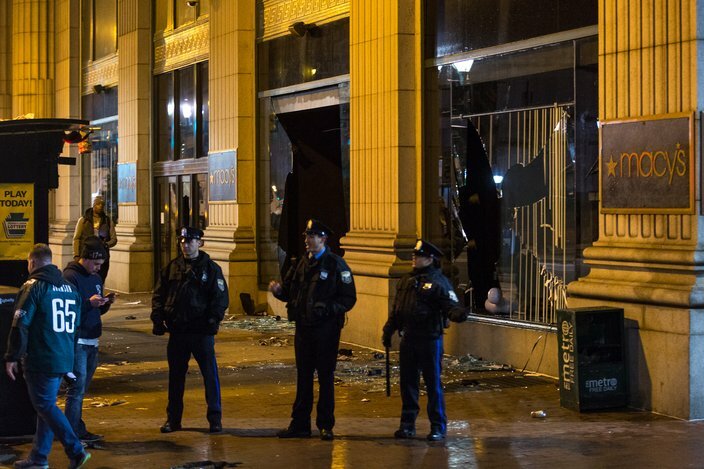 More than a dozen planters on North Broad Street were knocked over during celebrations following the Philadelphia Eagles' win in Super Bowl LII on Sunday night.